That’s all I have to say to the naysayers who carp endlessly about Mikey’s alleged shortcomings regarding the recent storm. I say, take a look at our street. The chauffeur had no issue whatsoever ungaraging the limo, and I’ve no doubt Mikey’s chauffeur had no problem either. Those who complain have only themselves to blame. Had they the good sense to move into a good neighborhood, onto a decent street, they’d have no problems whatsoever. For the love of Smedley, is it Mikey’s fault if their chauffeurs are unable to manage? Sack them all, say I, and seek out replacements with intestinal fortitude! Yet another upside is, as beginners, these rabble will certainly accept lower compensation. Why waste one’s hard-inherited capital on exorbitant salaries when one could invest in a bank and see an upside? Mikey is doing an excellent job, and has seen to it once again that those who count are taken care of. It’s not as though properties in good neighborhoods are unavailable. One simply has to have the wherewithal to purchase in the right place, and one will be well-taken care of. It’s as plain as the nose on Joel Klein’s face, which I shall miss dearly. Fortunately he’s always an email away. And for those of you who have criticized Joel as unresponsive, I find he immediately responds to my missives. You need only be polite, live in the right neighborhood, and give generously to the right causes. I never cease to be amazed at the lack of foresight and courtesy in your average rabble. I will wholeheartedly support Mikey when he seeks his fourth term. Anyone who does not simply lacks the judgment it takes to benefit from the system, which can be easily circumvented. I’ve graciously provided several examples in this very piece, and if one chooses not to avail one’s self of them, one has only one’s self to blame. 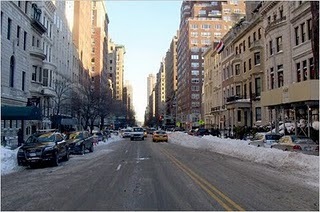 And one more tip–if you failed to plan, and live on one of those unimportant side streets, have the chauffeurs band together and dig out the street. For goodness sake, it’s not as if they’ve got anything better to do! Fourth term!! For the love of the pool boy, say it ain’t so! For goodness sakes, this is America! Mikey financed the third term fair and square, and has every right to do the same for a fourth. We are not communists, after all. I think the mayor needs to clean all the streets. I understand he might want to clean his own street first but everybody needs to get out. What a tiresome comment. If they wish to navigate, why haven’t they moved to a Street of Importance by this juncture? I like your ideas about schools but I respectfully disagree with you here. Everyone needs to get out no matter where they live. One day I will take a nice royal dump by the Mayor’s door. Zounds, Smelly, you need to regulate who may and may not post here. Dear Smelly: what are you doing wasting your time on this blog, when you could be making me cocktails down at poolside at our little cottage in Palm Beach? Enough already. Mike can do very well without your feeble defense, thank you very much! It was not I who wrote the above. How tacky, to have such a thing as a little cottage in Palm Beach. J. Pilkington is correct. Sometimes the rabble needs an outlet. They may spout their bile here, and it’s certainly preferable to their taking action elsewhere. After all, who really wants a bunch of blithering yahoos on one’s doorstep with torches and pitchforks? Unless, of course, they’re demanding tax cuts for us, as they seem to do more often than not lately. For goodness sakes…when will the riff raff finally understand they are completely irrelevant? By all measures, the average American has become redundant; replaced by affordable, overseas labor and simple, technological advances. I say, it’s encouraging to see our efforts to educate the riff-raff have been so effective. Thank you so much for your comments. We will redouble our efforts. After all, why should we be satisfied with simply doubling them? What forth term? Didn’t you get the memo? Mike Bloomberg alredy is NY mayor for life! lol!